Nowadays, it seems that anything goes when it comes to hair. Punk hairstyles that used to be deemed too extreme are now commonplace. They can be seen in on the runway, in fashion magazines and on brave souls with daring street style. 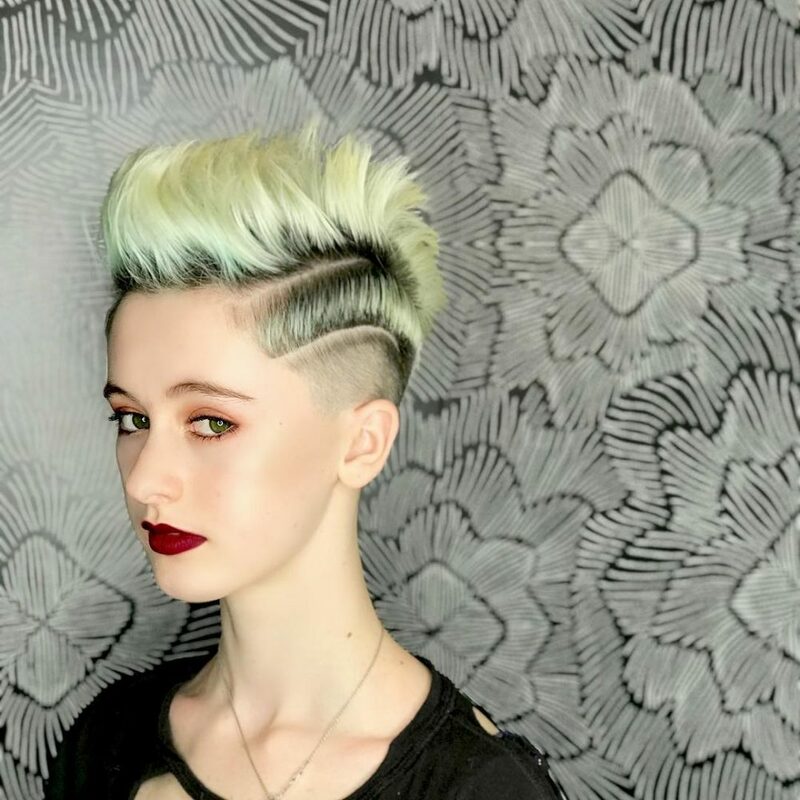 If your personal style is a bit eccentric, or if you simply like to be different, take a peek at these edgy punk hairstyles. You’ll find candy-colored creations, great undercuts, and twisted, disconnected hair looks for the punk in all of us. Show off your twisted style and declare your independence from mediocrity. Be bold, be brilliant, be YOU and make a bold statement with one of these edgy looks! Anyone who’s brave to rock this super funky hairstyle deserves to be crowned an eternal blue goddess. 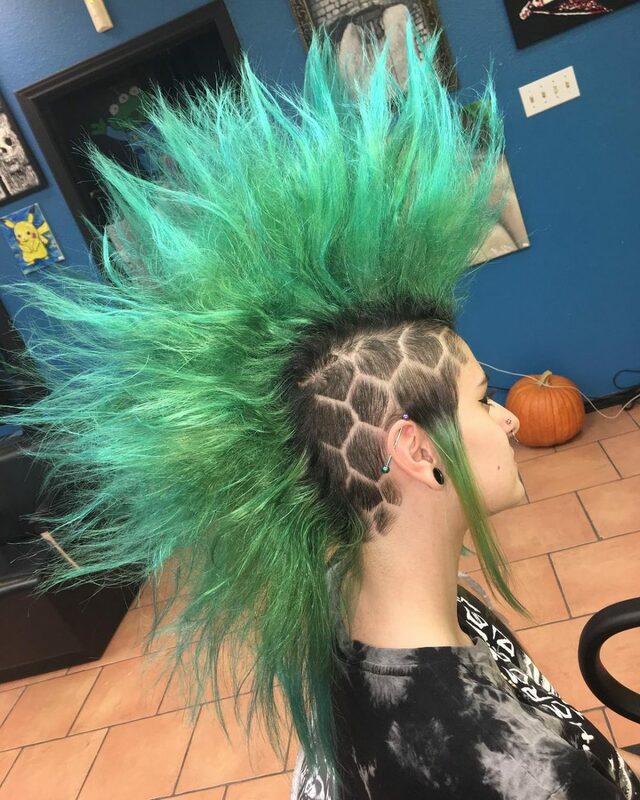 Pair with an undercut and some waves for added style and some serious punk mermaid vibes. This look is edgy! I love how the patterns are so different but go perfectly together. This is such a fun and unique look for a special event. Anyone could rock this style, with lots of hairsprays! 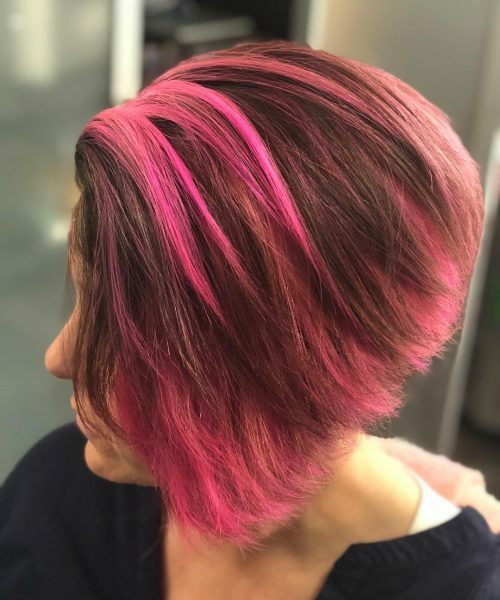 I customized my clients look to match her fun personality! She loves to stand out and has an edgy attitude. I buzzed all around and carved an “EKG” (heartbeat) design on the side using my trimmer. 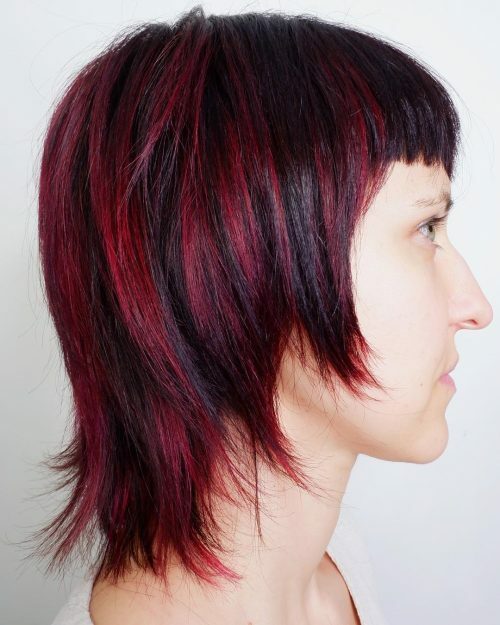 The top was razored for texture to give it an effortless punk style that can be achieved by herself at home. We went for a dusty rose color with a shadow root for depth. 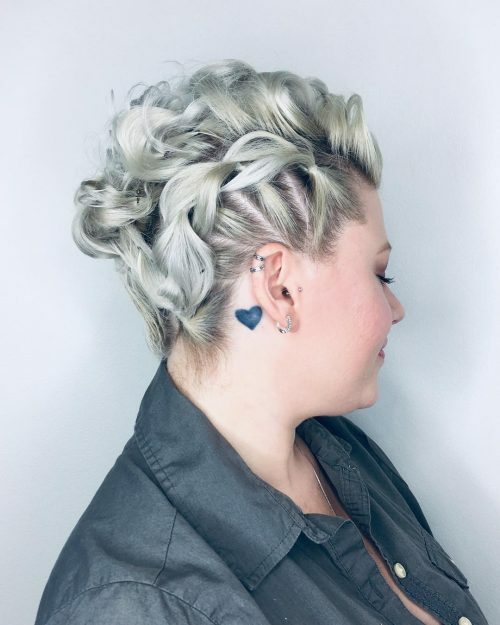 I used a Q-tip to clean the color off of her scalp along the design to make it pop! This look is extremely easy for someone who wants to just style and go. Depending on your hair type, all you’d need to do is smooth your hair using a hairdryer and brush. For fine hair, you can add mousse before drying. A trick for extra volume or spikiness is drying the hair to the opposite direction you plan on wearing it, then take a pomade to rub it in your hands and push the hair back over using your fingers. 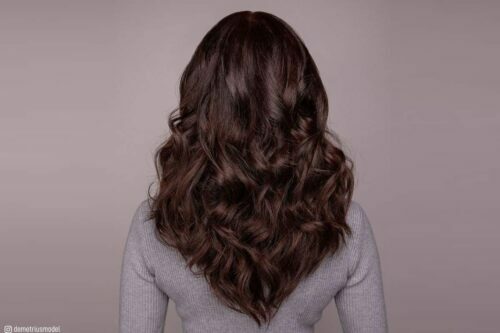 For coarse curly hair, a flatiron might be necessary after drying. You can use a texture spray or dry shampoo on the roots to fluff it up and make it messier. Adding hairspray will help keep your style in place. The amount of volume on top and how you wear the front/bang area can be adjusted to complement your face shape! An experienced stylist will discuss this during the haircut consultation and recommend what is best for you. This look is edgy, youthful and fun. The color used in this look is from the new Manic Panic Professional line. Punk is making a comeback, called under different names, and I find it interesting that Manic Panic, which was one of the first punk hair color companies has evolved as well. My favorite thing about the look is that it incorporates the natural hair color of my client. The placement of the pink is offset by her natural gray hairs. It’s a fun blending of those three colors using slices and weaving techniques. Fashion colors are super fun but also incredibly difficult to maintain. Pink hair is probably the most difficult. With all my clients choosing to take the leap to fashion colors, I talk to them about the care and maintenance and that includes potential bleeding on pillowcases and towels. Cold water is key. So if my client must shampoo their hair twice a day and only like hot showers, I have to get very creative with how to achieve this look. This particular client is in her mid-forties and this has destroyed any idea of her being a run of the mill soccer mom. She’s exactly like the haircut edgy, fun, and desires to be different and doesn’t have a problem with being the coolest in the room. This is ideal for those with a pinkish and bluish undertones. The deep colors and the dark highlight lets you wear that punk rock vibes. I would describe this look as edgy, alternative and not for the faint-hearted. 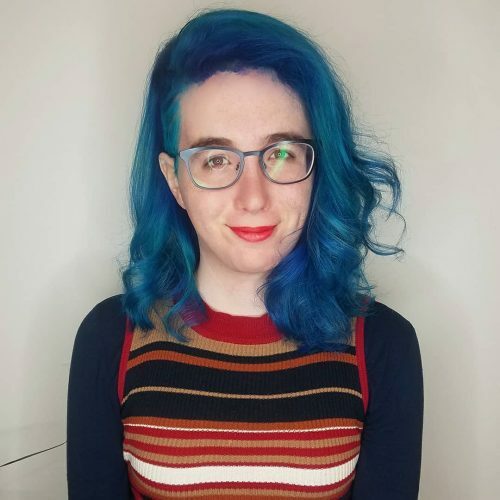 The color works amazingly with the cut for this extremely cool lady. 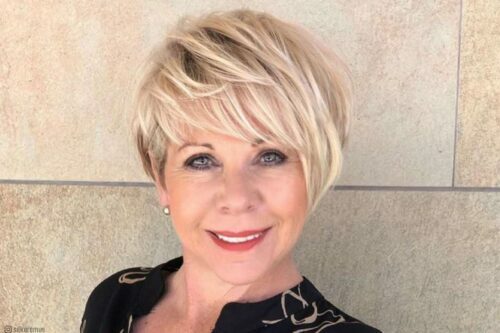 I wouldn’t recommend this look for someone who had very fine or fair hair or with a round or oval face shape. It’s more of a music inspired look from the late 70’s punk era. So if you’re into punk music, this would be perfect. The products I used for this was Swartzkopf Mowhawk Dust with an extra hold molding spray. If you use wax, it can weigh down the Mohawk and it won’t stay in the style for long. I would describe this look as soft punk. Having that edginess while still maintaining the innocence. 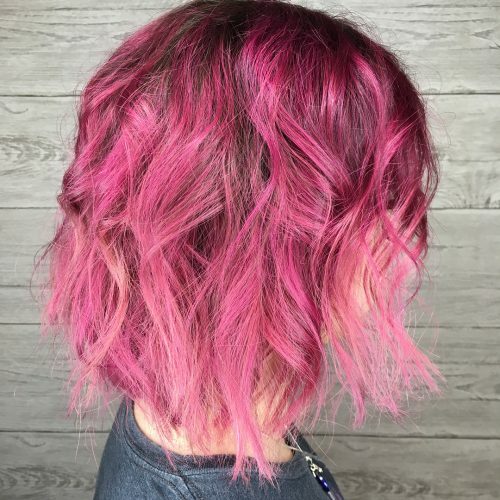 The different shades of pink hair color and the soft layers, with the blunt perimeter, makes this look the perfect transitional step to going full punk! I would recommend this look to someone who loves to change it up daily! 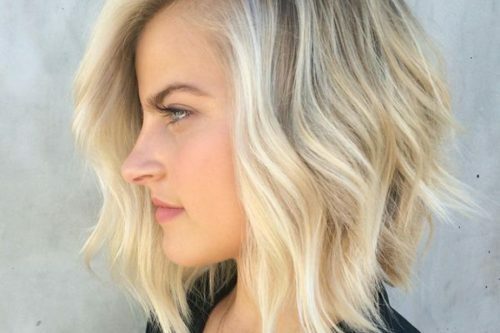 The versatility of this cut is amazing! You can wear this sleek and sophisticated or rock it out with some crazy texture and curl! For this look, I used a smoothing balm and a strong-hold mousse. My guest’s natural hair is untameable curls. The smoothing balm and mousse allow more control over those crazy strands! 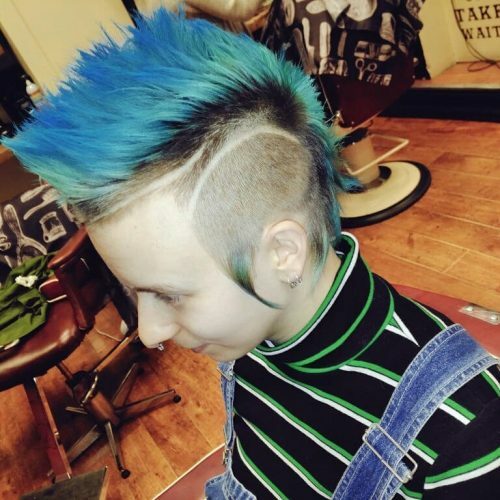 Take a leap with a semi-permanent color and let your freak flag fly with confidence! Attitude meets style as you wear rock ‘n roll on your mane. 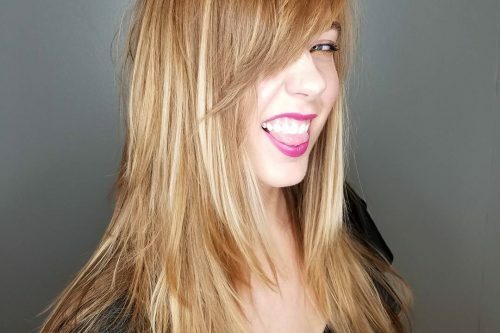 Stylist Amber partnered a dark ginger hue to liven up straight hair. 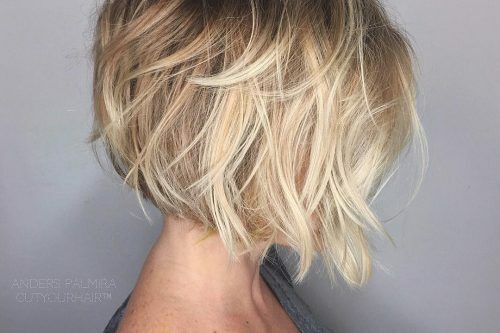 I would describe this look as a modern mullet that is very disconnected with tons of texture. This is a playful take on one of the most popular looks from the 80s. I love how this style can fall into so many categories from whimsical and pixieish to rocker chic. This definitely a more fashion-forward style. A bold personality and aesthetic is required to pull this look off. The best thing about the modern mullet is that it works best when slightly unkempt, so not a lot of styling is required. At most, I would recommend a dry shampoo and texturing paste like Aveda’s Control Paste or Verb’s Sea Texture Creme for a piecey, undone look. I would describe this look as “Wild Thang”. 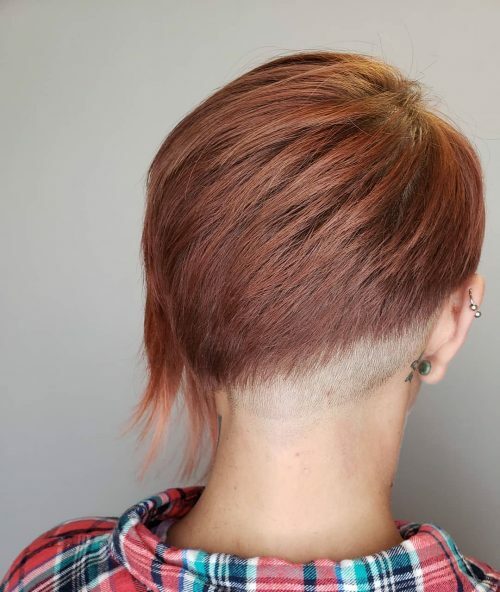 Thia is a disconnected haircut with shaved sides. The client is growing her hair back after chemotherapy which caused her texture to drastically thicken. She has been working on a way to tame it until the top grows out, and I think we nailed it with this look. My favorite thing about this style is the look of the deep violet against the yellow, and of course, the hand painted leopard pattern! 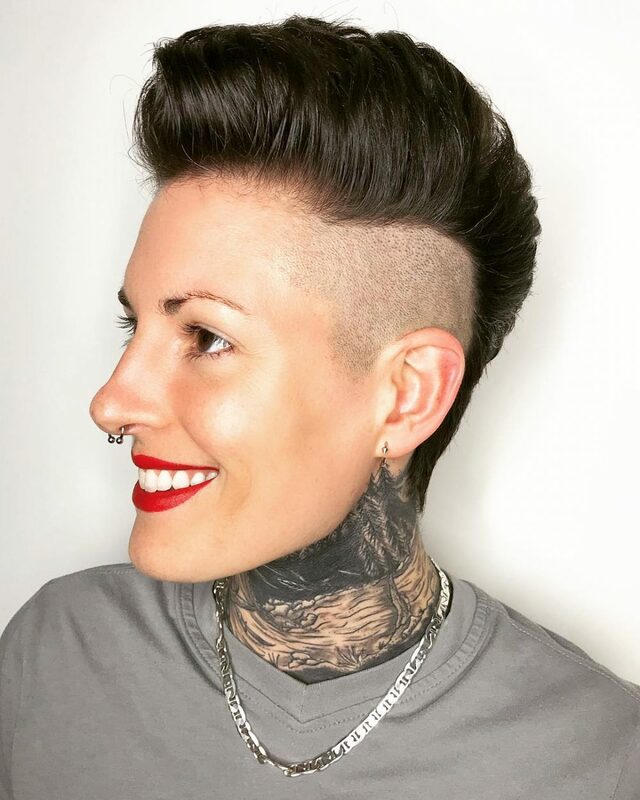 For anyone considering this look, remember that this print can easily be cut out after your sides grow a bit to leave a fairly low commitment color. 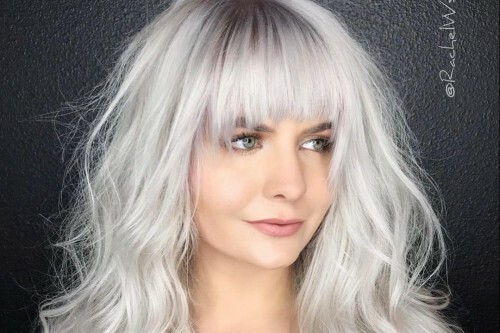 Conversely, if it’s something you’d like to keep long term, you will need to sit and have your color done and the pattern painted back on at each haircut, or possibly every other, depending on how much of the pattern is cut out. I call this undercut pixie “The Green Lantern”. I love the strong lines, texture, and the way the color I created makes it all pop. Most people who want a look like this are already experimenters. They have been playing on their own long before they get to me. I want to take them to the next level. I emphasize maintenance and make them realize that keeping the look “high fashion” means changing it up. Keeping it sharp is essential! It’s my job to fit the right cut on them and teach them how to maintain it. Not as dangerous as it looks, spikes on your hair is exhilarating cool. 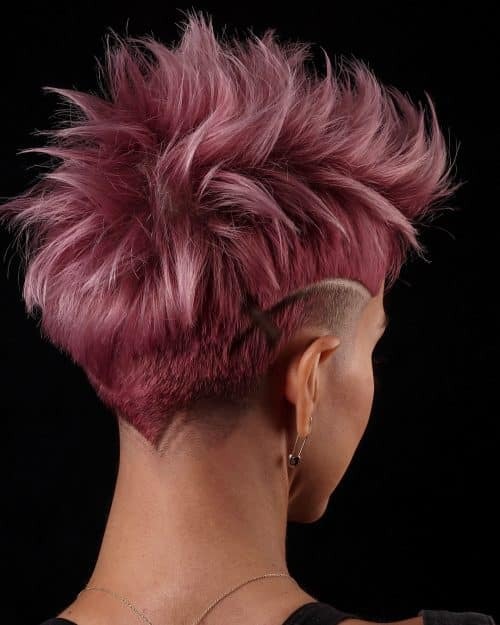 You could go all in with a bold hair color and some visual undercut. This is a pompadour mohawk! The style features lots of height built up from the front all the way to the nape of the neck, with each side buzzed. My favorite thing about this look is how well it complements the client’s features, really adding to her personal style. It’s clean, simple, and endlessly cool. If you’re considering a look like this, it’s ideal for those with a strong bone structure and an oval face shape. 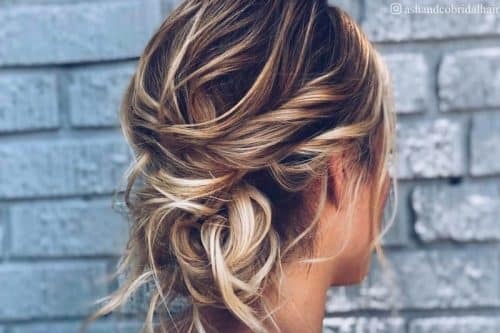 This hairstyle requires time for styling and a few amazing products, so it’s definitely not a low maintenance look! I recommend Oribe Volumista Mist for volume sprayed from roots to ends prior to blow drying with a small to medium round brush. Follow up with Oribe Superfine Strong Hairspray to lock in hold, then lightly mist with Oribe Shine Reflecting Spray for a glossy, glass-like finish. Voíla! 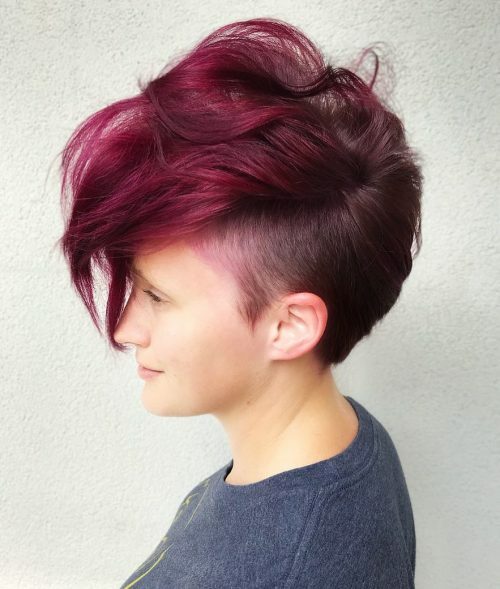 Mohawk and bold hair color just scream punk, doesn’t it? I absolutely love this look. It’s a classic Joan Jett shag that can be worn many ways. 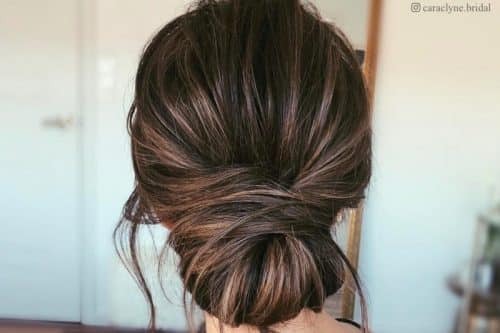 I adore the versatility of the look because it can be worn super textured and styled very dramatically, or it can be kept simple and toned down while still having an edge. 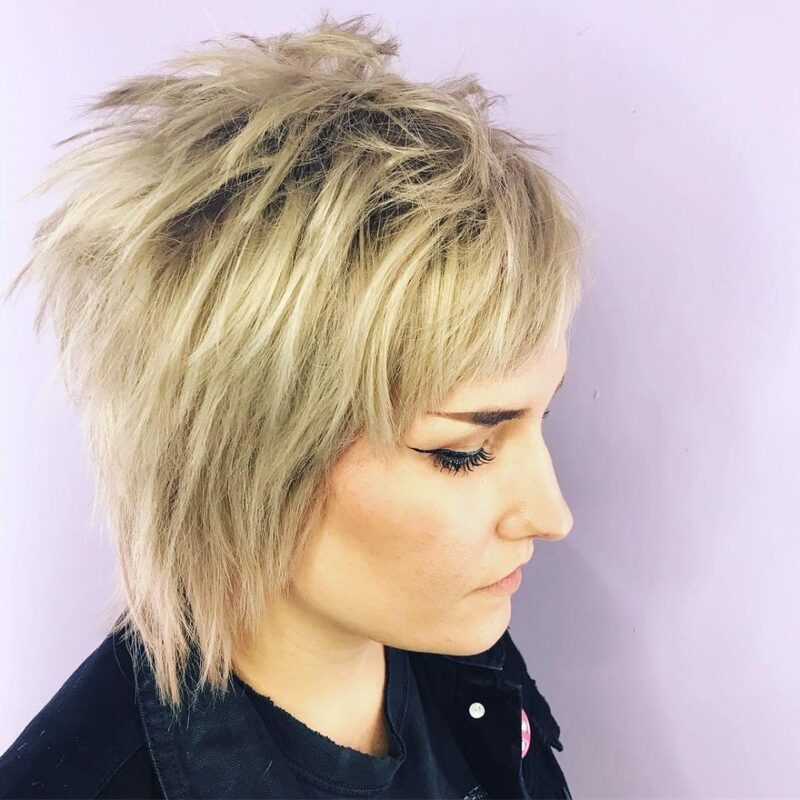 This cut can be accentuated with many color options as well, which makes it such a diverse and classic rock and roll haircut for anyone wanting to try something edgier. 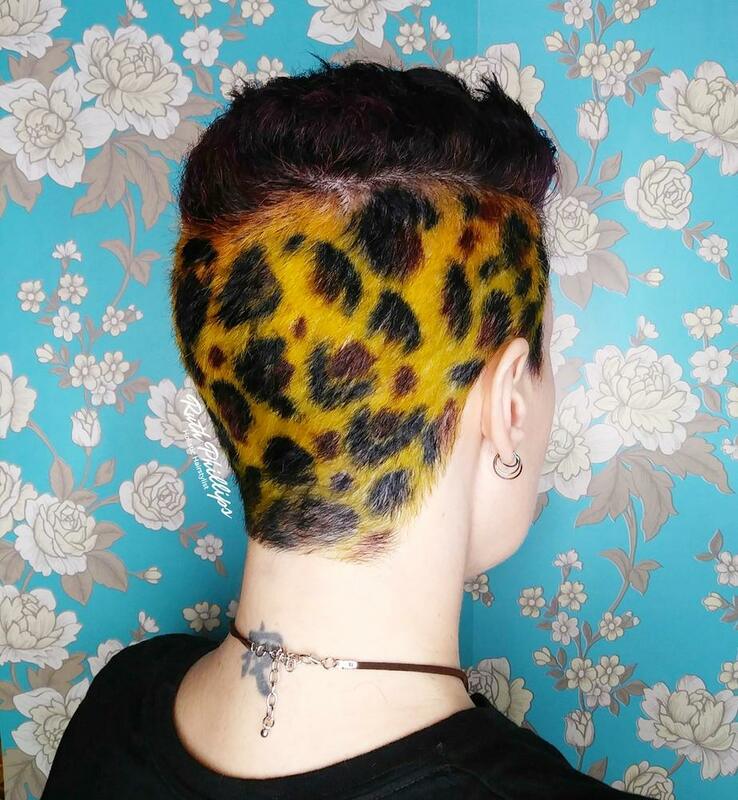 You definitely have to be bold to rock this cut. This cut can be customized for any face shape. You can also wear it with or without a fringe. 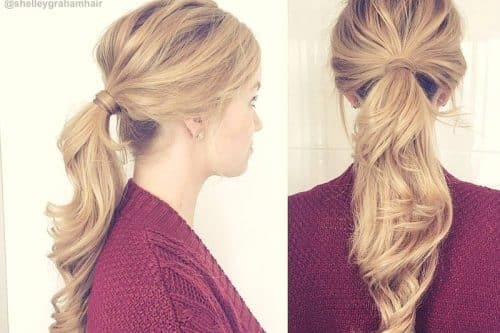 It also looks amazing on mid-length to long hair. This cut was done with my Hatori Hanzo Mamba shears, my Hatori Hanzo Kasumi texturizers, and accented with a razor. Texture paste and volume boosters will be your friend while styling this look. For her look, I used Kevin Murphy Volume.Boost, Bedroom.Hair, and Night.Rider texture paste. This is a statement hairstyle that is not for the faint hearted! The recreated mullet is back with more dramatic angles and texture in all the right places. I recommend blow drying in a volume cream for texture and shine. Once dry, spray in a salt mist and scrunch the hair for that gritty look. Lastly, use a matte wax to piece out and accentuate the look. 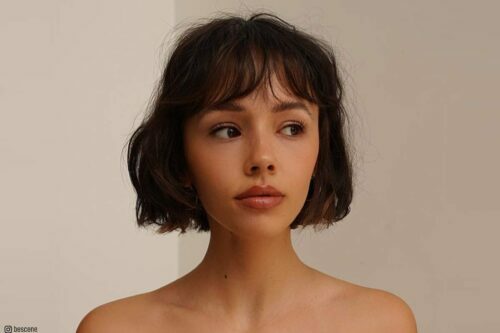 This look is so versatile and can be tailored to everyone, but it would work best on someone with medium to thick hair that doesn’t mind spending some time styling their hair. It will flatter a heart, oval or diamond face shape. This look is also nice for someone with a large nose as it draws attention away from it with the hard angles. It can also open up the face of someone with small features. This look is inspired by the Deathrock fashion style and the color is my client’s preference. It’s a teased mohawk called “Deathhawk”. The honeycombs were my client’s idea. She is a beekeeper and wanted me to put her passion in her hair. I was excited and all for it! I used Joico Cobalt/Peacock Green semi-permanent color and Pravana Neon Greens. For the shave, I simply used the Wahls peanut trimmer. As for the style, I backcombed and teased the whole hawk and sprayed it with Bedhead Masterpieces. People with medium to coarse textured hair are the easiest to tease into a style like the Deathhawk. It is not a good idea to style fine/thinning hair like this. Most face shapes work with this style. As far as lifesstyles go, it is definitely for the artistic, creative and rebellious types. It’s very outside of the box and is a loud, abrasive look that will get lots of stares! I would describe this look as punk with style, the grungy answer to a precision haircut. It’s got some triangular shape with very choppy short layers. My favorite part, aside from the silhouette, is all the technical aspects that went into creating this hair shape. I also love that it still looks great on her naturally wavy hair. Some of the top products I recommend using are Lanza’s Texture Spray, Puff Me Volumizing Powder, or even Kevin Murphy’s Rough.Rider. You really need a dryer feeling, gritty product to get that hair to stand up and to provide the broken up texture in the ends. This cut works great on hair types between straight and wavy You could go for it curly though! I do think this style is really good for a person that wants an edgier look, but still needs to maintain professionalism. Depending on how you push this haircut around makes it more punk or more polished. 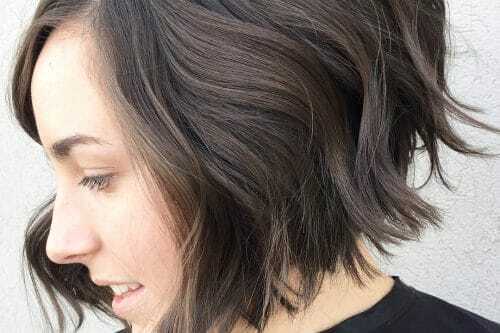 Although this style would look great with any color hair, I do feel the lighter color lends better to seeing the texture.